From L to R: Bill Howatt (Morneau Shepell), Louise Bradley (CEO of the Mental Health Commission of Canada) and Lisa Couperthwaite (CAMH; Centre for Addiction and Mental Health) take part in a panel examining mental health issues at work moderating by Globe Health Reporter Andre Picard. The panel was part of The Globe Human Resources Summit: Solving Workplace Challenges in the Modern Economy. At the end of the summit, the Employee Recommended Workplace Awards were handed out for 2017. The award was co-created by The Globe and Morneau Shepell. Most corporate offices have a first-aid kit somewhere, stocked with Band-Aids. Most also have policies readily in place allowing time off for physical ailments and will spring for ergonomic seats or standing desks for people in physical discomfort. But where's the first-aid kit for mental health emergencies? And what would that even look like? Lisa Couperthwaite, a clinical psychologist at Toronto's Centre for Addiction and Mental Health, noted that a kit in this sense consists of training for employees in how to help someone experiencing a mental health issue. We, in effect, are the Band-Aids. "With mental health first aid, it's much more about the interpersonal interaction between people and the informal support that our colleagues provide," she said, speaking at a panel discussion on mental health issues in the workplace sponsored by The University of New Brunswick. The panel was part of The Globe and Mail's Human Resources summit: Solving Workplace Challenges in the Modern Economy held June 21. The summit also hosted the presentation of the 2017 Employee Recommended Workplace Awards, which recognizes companies that put the health and wellness of their employees first, which was co-created by The Globe and human resources consulting firm Morneau Shepell. "A lot of the interventions that we use to respond to people who are having a mental health issue are the same things that we can use to build resiliency and build collaboration. [They] really can help the bottom line for the organization," she said. "It's not just good for the person with the mental health issue. It's good for the entire culture, organization and competitiveness, performance, all of that," she added. For instance, a mental health incident can arise during an intensely stressful moment at work. It's an everyday occupational mental hazard in any office and, in fact, often adds purpose and meaning to work. Yet, people may respond very differently to stress. "There's a threat response," Dr. Couperthwaite said. "There's also a challenge response where people really rise to the challenge, and they are at their best in terms of performance. There's also tend-and-befriend responses, reaching out to one another and being supportive and creative in that culture. "Then there's also the blah," she says, imagining an employee who has a deflated response to stress. "Those are the employees we really need to worry about." This can make a first-aid response more nuanced, since someone experiencing severe problems may not be showing overt signs, but become withdrawn. That's where training can perhaps help colleagues to recognize this in others and offer support, Dr. Couperthwaite indicated. The aim, in the end, is to make supporting mental health issues as normal as physical ones. To try to help that, Louise Bradley, president and chief executive officer of the Mental Health Commission of Canada, noted the psychological safety standard released by her organization in collaboration with the Canadian Standards Association. "This is something that is really concrete and is available to small, medium and large businesses and organizations," she said. In fact, the standard has been downloaded in 15 different countries, she noted. "The magnitude and response have been far greater than any of us ever thought." 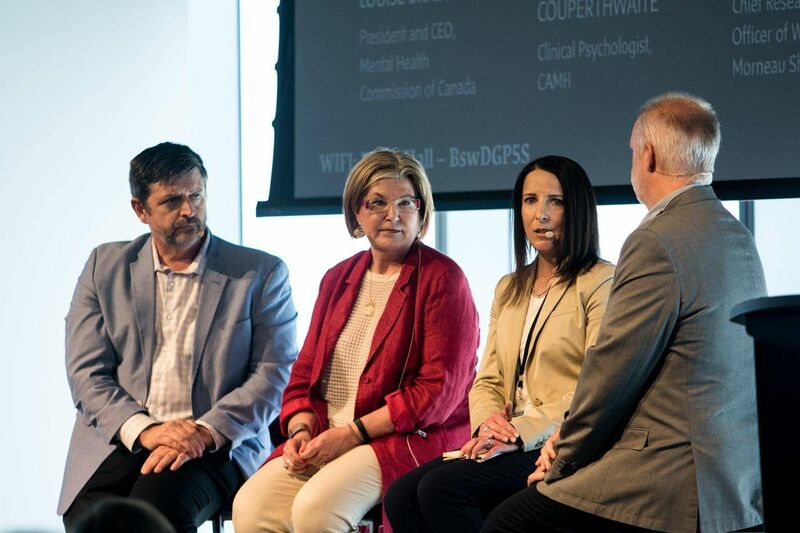 However, panelist Bill Howett, chief research and development officer of work force productivity at Morneau Shepell, added that one of the biggest barriers in all of this is people not even knowing that they have a mental health issue. Opening up a dialogue in the workplace can help identify problems, not in terms of self diagnosis, but in how individuals respond to difficult circumstances. So, it's not about people asking themselves, Do I have depression or anxiety? "It's about how they are actually processing their workplace, how they are actually processing their experience with their peers, how they're dealing with their financial health, how they're dealing with mental health," Mr. Howatt said. For companies, "a mental-health strategy doesn't mean a policy, some training, an EAP [employee assistance program] and checking the box." It's about integrating mental health into the company's human resources strategy, making the process more "organic," he added. This isn't to say that mental health policies in the workplace somehow abrogate an employee's responsibilities for their own health, he insisted. Instead, it opens up the conversation. It better addresses how to handle change and potential problems, before they occur. "Every employee owns their own mental health and every employee owns their career. But my thesis is that we forgot to teach many people how to problem solve and deal with the challenges of their life," he said.